A lovely soft stretchy maxi dress, with adjustable straps and uneven hemline. 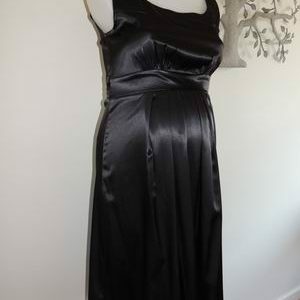 The dress is in excellent condition, by Ninth Moon Maternity. It has a lovely wide black stripe and white stripe. There is plenty of stretch in the fabric. The dress also has a built in shelf bra for extra support. Be the first to review “Black and White Strappy Maxi Maternity Dress” Click here to cancel reply.